For a region as tech-friendly as the Bay Area, it’s surprising that more theaters don't cater to the computer-age canon. Indra’s Net, in Berkeley, specializes in plays specifically about science and scientists, including Heisenberg, Darwin, and Hawking. Dreams on the Rocks Productions puts on rambunctious reenactments of nerd-camp movie fare such as Flash Gordon and Barbarella. But only Quantum Dragon Theatre, active since 2016, has fully embraced the dramatic potential of speculative fiction. Producing work that runs the gamut from space travel to spellcraft to classic science fiction, Quantum Dragon offers audiences a chance to geek out via one of our most classically analog art forms, and have fun doing it. 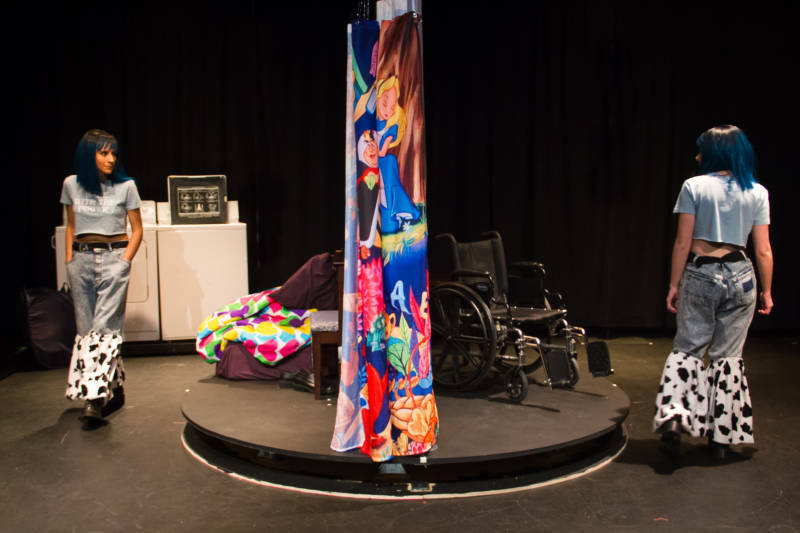 In their current production—The Do’s and Don’ts of Time Travel, by Pennsylvania-based playwright Nicholas Wardigo—Quantum Dragon serves up a smart, compelling drama about the personal implications and motivations for time travel. 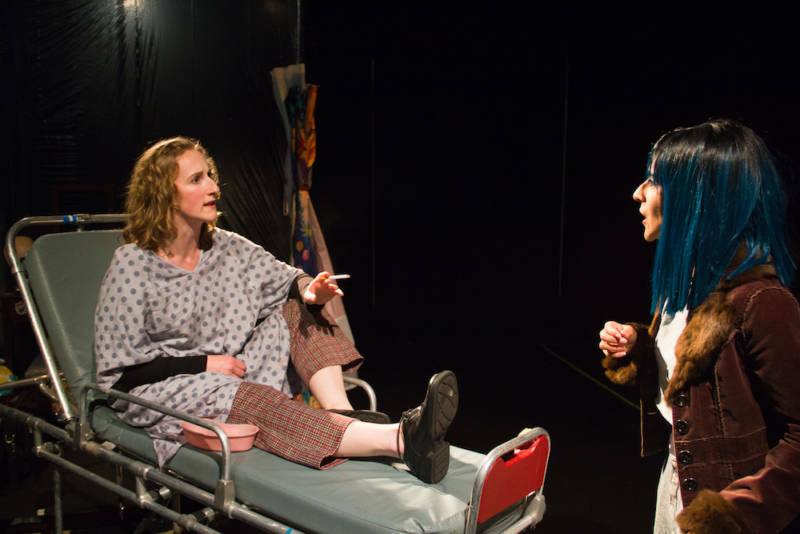 In addition to the play's emotional arc, the audience is treated to one character’s thesis on time travel in movies, and why there’s always a moment in the plot where logic fails. More than just a clever gimmick to explain away any logical fallacies found within the play, this thesis sparks an opportunity to ruminate on the science behind the fiction, both during the play, and after. 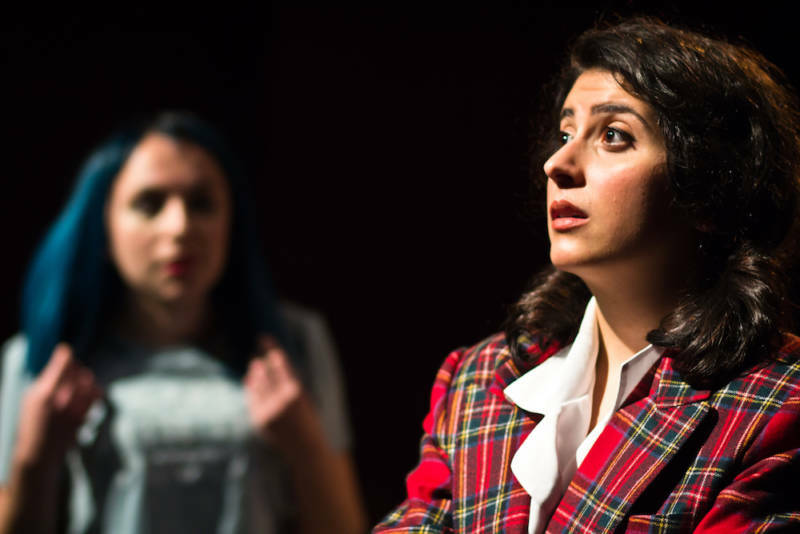 Miranda Reilly as Zoey and Marisa Darabi as Rachel in 'The Do's and Don'ts of Time Travel' at Quantum Dragon Theatre. Presented by the character Rachel (Marisa Darabi), the thesis breaks time travel into three basic methods: Force of Machination (as found in Back to the Future, The Terminator, and Hot Tub Time Machine), Force of Nature (as in Army of Darkness and Time Bandits), and Force of Will (The Time Traveler’s Wife, Slaughterhouse Five, and Donnie Darko). It’s this third method that our lead time traveler, Zoey, avails herself of. 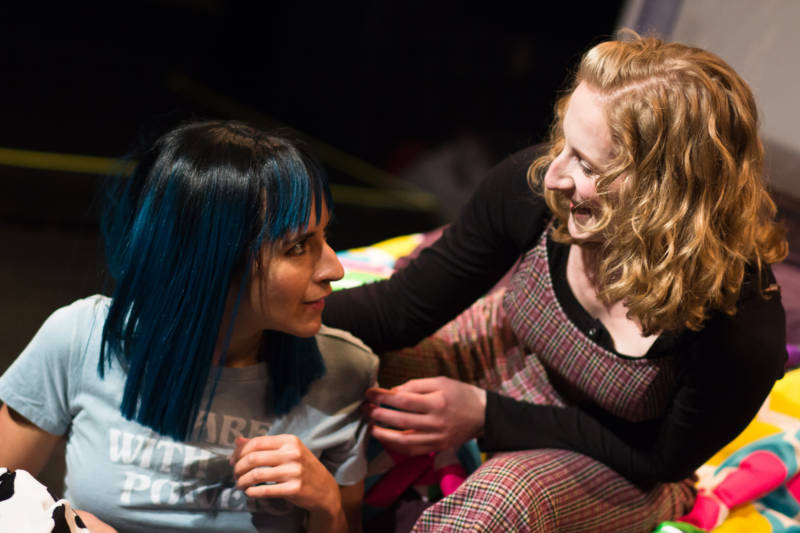 Zoey is actually two Zoeys, played by Miranda Reilly and Kitty Torres (who swap their respective roles each night), and although Rachel points out several times the fallacy of your future self and past self meeting up in time together, they immediately do just that. Circling each other warily in a laundromat, matching ombre-dyed blue wigs framing their watchful faces, Zoey 1 and Zoey 2 are clearly uncomfortable with their encounter, even though—it’s intimated—they’ve done it all before. You see, Zoey’s been traveling in time for many years. A “looper,” she relives the same two years over and over, trying to change the outcome: the long painful decline of her partner, Claire (Caitlin Evenson). It’s the motivation behind her “Force of Will” method of time travel, one which baffles her friend Rachel, both in terms of the relationship and of the chosen loop. But it’s this motivation, and the evolution of Zoey’s approach, that gives the play its emotional resonance. That's because at its core, Do’s and Don’ts is as much about the heart as about the practical how-to’s of traveling in time. Set in a world much like our own, except that the play's young lovers still use answering machines, there are no great leaps in perception or deep knowledge of time traveling as leitmotif required of the audience. Being a time traveler is just one of several character traits in Zoey’s arsenal, which also include a love of James Bond, a curious inability to sort her own laundry, and an irrepressible free spirit. Her need to relive the same tragic two years may have the appearance of an unexplainable masochism, but to her, it’s the mark of a serious commitment, one that Evenson’s Claire doesn’t make easy. Perfectly contained within the cozy confines of the Phoenix Theatre, a miniature revolving stage (designed by Katie Whitcraft) allows for simple set changes with a minimum of disruption, while the equally effective costuming (by Emily Dwyer) offers a quick visual shorthand to the interior selves of each character. Director Anna Smith’s light touch imbues the production with a matter-of-fact realism that makes even the most scientifically improbable moments entirely natural. Without a need for flashy special effects or stagecraft, this understated foray into fantasy feels more down-to-earth and perfectly plausible than any number of “living-room” dramas. As such, The Dos and Don'ts of Time Travel will certainly appeal to a broader spectrum than those who self-identify as nerds. Anyone who recognizes theater’s potential for grappling with the bigger questions of our human existence, regardless of genre, will find resonance in this production. 'The Dos and Don'ts of Time Travel' runs through Jan. 26. Details here.